Seen it cheaper? Seen it discounted? Seen it with a special? We will always do our best to offer you the most competitive pricing. If you have seen the same item elsewhere at a lower price then we will do our best to match pricing. We like to sell lighting and our lights to happy and loyal customers and we know you will understand if we cannot always be at the very lowest in the market. Our goal is to win the loyalty of the south west in purchasing quality and branded lighting fixtures and fittings at realistic prices. 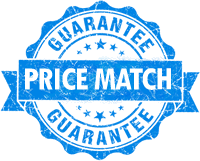 If you find the same product online or elsewhere we will do our best to match that price! Meaning if another site has the same product for £5.99 we will also offer £5.99 with a possible discount. We offer this service across our whole range of products! So anywhere you see the Price match button you can check. I pressed submit now what? Please wait for a reply. We aim for 24 hours on business days. What if it’s from a catalogue or print? Please use the additional information box and let us know. Am I 100% getting a price match? This may not always be the case as we will still need to evaluate the situation. Of course, please call us on 01823 334432 and we take the information needed from yourself. Where can I find the compare button? The button can be found next to the products price. Do I get an extra discount? If you were to challenge us we can consider a deal for you! Once you get the pop up you will need to fill in the following fields. Don’t worry about changing the product name or Luminations price. -	Please fill in your name, this can be your full name or just your first name. -	Please fill in your email, if you don’t wish to fill in your email please enter in an alternative contact such as a house phone number or mobile phone number. -	The price you wish for us to match up to. -	The link of the site you would like us to compare it against. -	Anything extra you wish to mention. The item must match the item – same colour, model, size etc.